the role and method for militant specific intellectuals to intervene in our present, drawing on The Punitive Society as a political text. The three articles push hard on Foucault’s marriage of a political economy of punishment and a genealogy of morals in these 1973 lectures. Didier Fassin suggests that “the political and moral economies of punishment are somewhat disjointed” and may not really reflect the reality of how prisons worked. Axel Honneth discusses how they produce a tension—a dual focus, on the one hand, on the body, on the other, on the soul—that leads to a “biopolitics and psychopolitics” that are hard to reconcile. Following Nadia Urbinati‘s proposal to treat these 1973 lectures as a “political text”—and in the vein of her provocative statement that reading these lectures shows that “Foucault is not Foucault-ism”—I propose to explore here this problem of the marriage of political economy and the genealogy of morals in relation to our present political condition of massive racialized over-incarceration. I will leave for the Foucault 3/13 seminar, which will be live-streamed here, the other critical issues, including the model of civil war, raised in these three powerful articles. I intend this post to specifically address Didier Fassin’s urgent call, after having spent four years in a French prison as an ethnographer, to come to terms with “the singularity of imprisonment, the specific violence of confinement and the particular consequences—social, political, ethical—of the generalization of its use,” as well as Kendall Thomas’s intervention from the last seminar, Foucault 2/13 on Penal Theories and Institutions, to focus us on the stakes of the conversations we are having in #Foucault1313. 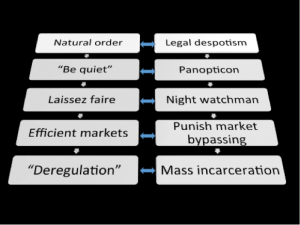 The analysis explored, on the one hand, how the concept of the free market emerged from eighteenth-century notions of “natural order.” The analysis traced the transformations and variations from an early divine notion of orderliness tied to natural law in the work of François Quesnay and the Physiocrats, through Jeremy Bentham’s (admittedly complicated and messy) maxim that the government should “Be Quiet” in economic affairs, through the more secular ideas of self-interest, expertise, and informational advantage reflected in conventional 19th century laissez-faire ideas, to the cybernetic notions of “spontaneous order” elaborated by Friedrich Hayek, and finally to the more scientific and highly technical economic theories of the Chicago School of Economics regarding the efficiency of competitive markets. This is the left column. In fact, Posner would define crime as inefficient behavior or market bypassing in 1985. Just like legal despotism in Physiocratic thought, the criminal law represents the outer boundary of the free market and natural order. Penal law is its diametrical other, where the state must intervene through punitive practices in order to sustain and guarantee the natural orderliness of the economic domain or free market. This is the right column. Throughout, the analysis sought to demonstrate the paradoxical linkage of the notion of orderliness in economics with the need for a Big Brother state when it comes to policing and punishing. This is the series of synchronic arrows relating the two diachronic series. In contrast to other critical thinkers who also study what has been called “neoliberal penality” today—namely, the paradox of a supposedly hands-off government and a massive prison apparatus—I argue that the symbiotic relationship preceded the neoliberal turn in the 1970s and was itself inscribed in early liberal thought in the eighteenth century. I trace our present political condition back to the eighteenth century and argue that this paradoxical set of beliefs—on the one hand, in the incompetence of government in the economic domain and, on the other hand, in the competence and legitimacy of government in the penal sphere—has facilitated the exponential growth of the prison and jail populations in the United States, not only with mass incarceration in the twenty-first century, but also at the birth of the penitentiary during the “Market Revolution” of the Jacksonian era. An undercurrent in that political economy of punishment—perhaps one that was too far under the surface, but one that I would like to explore here—concerns the mechanisms and devices by which these concepts of natural order and policing would become accepted, tolerated, and so pervasive. And one critical way to address this question—one to which we often do not pay sufficient attention—is precisely the issue of moral economies, of the moralization of social relations and behaviors. This is a topic that Didier Fassin has explored in depth. The place to start is with E. P. Thompson, whose work on “The Moral Economy of the English Crowd in the Eighteenth Century,” or more generally, on the notion of moral economies, would make us rethink seemingly spontaneous and spasmodic food riots as fully-coherent resistance to new forms of economic relations and ideas. Thompson highlighted the extent to which the resistance was itself a moralized resistance, grounded in notions of moral fault, responsibility, and blame, of right and wrong, of good and evil. The riots were not merely irregular, spasmodic responses to shortage and hunger; rather, they represented a righteous indignation, a moralistic and thus political response to the shift away from a paternalistic rationality of custom, intended to protect the people, to a purportedly amoral and abstract force of the market. For Thompson, the most compelling proof of the moral underpinnings, you will recall, was that the seditious crowd did not simply steal food, but rather, against their own interests, destroyed the mills, the very instruments that would have provided them with food. The riots, Thompson showed, were aimed at dismantling the instruments of the new political economy. It may be surprising to start with Thompson because he was moralizing—and justifying—resistance, whereas the task here is rather to show how these new political economies became acceptable and tolerated, in other words to enlist a genealogy of morals as a key element in the eventual acceptance of new economic regimes. This is where Max Weber—the Nietzschian Weber, the Weber of the Protestant Ethic in its original, not Parsonian version—would be so important. The spirit of capitalism would feel so natural to many because it had been, for many, a calling, as Weber suggested. Weber’s genealogy of capitalism passed through morals—producing new political economies and processes, such as “machine production,” that would govern our lives. The soil has to be tilled, it does not bear the fruit of capitalism spontaneously. So we have, then, Thompson on the moral economies of resistance, and a Nietzschian Weber on the moral economies of acceptance. Foucault would marry the two in his Collège de France lectures on The Punitive Society in the winter of 1973. Foucault would graft a genealogy of morals on a political economy by means of what he called “illégalismes.” But here again, we will have to take a step back to start with Foucault’s political economy. The core concept of illégalismes is a term that has somewhat erroneously been translated as “illegalities” in the English edition of Discipline and Punish. It would be more appropriate to use a neologism, such as illegalisms, because “illegalities” is actually the end state, that which, in some sense, resolves the struggle. Illegalities is what represents the culmination of a power struggle that operates through illegalisms. The idea of illegalisms, then, is that the law itself is a struggle, a negotiation, agonistic combat, a competition over the very question of defining the line of illegality—the line that divides deviations, disorderliness, rule-breaking, rule-interpretation, from illegality and the sanction. Foucault elaborated in 1973 a political economy based on this notion of illegalisms—a theory in three steps. As you realize, I am giving you the theory and not the historical details. Foucault then identifies, in a third moment, a turn to the penal sanction. 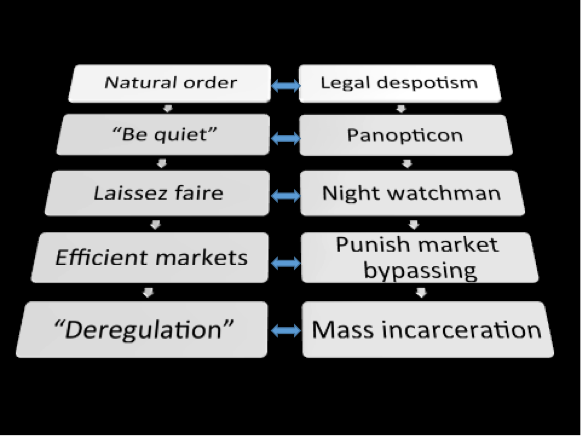 In the late eighteenth century, the commercial class seized the mechanisms of criminal justice to put an end to these popular illegalisms—not only the depredation of material property and private wealth, but also the “dissipation” of their own time and bodies, of the strength of the workers themselves, of their human capital (dissipation that took “the form of absenteeism, delay, laziness, parties, debauchery, nomadism.”) In this way, , the privileged would seize the administrative and police apparatus of the late eighteenth century to crack down on popular illegalisms. The result would be a turn to the penitentiary and the prison-form—which was not so much a model of confinement for violations of a statute, so much as imprisonment for irregular behavior. So far, though, we are still at the level of an explanation in political economy. But a genealogy of morals would come next. For it was only through the moralization of those acts of debaucherie and absenteeism that the managerial classes would be able to transform formerly tolerated behaviors, even encouraged behaviors, into illegal acts. Foucault would excavate and discover this move first in the writings of the Quakers and other dissenters. He located there a moralized discourse that would introduce the idea of the penitentiary, of penitence, into the sphere of punishment. He found echoes of this discourse among the more privileged classes of the early nineteenth century, echoes revealing how certain writers in France and England—Colquhoun in London, for instance—would use moral notions of fault, guilt, and penance to facilitate the construction of the capitalist enterprise. Unfortunately, when we teach morality, when we study the history of morals, we always analyze the Groundwork of the Metaphysics of Morals and do not read [Colquhoun], this character who is fundamental for our morality. The inventor of the English police, this Glasgow merchant … settles in London where, in 1792, shipping companies ask him to solve the problem of the superintendence of the docks and the protection of bourgeois wealth. [This is a] basic problem …; to understand a society’s system of morality we have to ask the question: Where is the wealth? The history of morality should be organized entirely by this question of the location and movement of wealth. There, hard souls, dry, fierce, devoid of moral ideas, will only obey their gross sensations; laziness, immorality, greed, envy will prove the irreconcilable enemies of wisdom and labor, of the economy and of property. There will thrive misdemeanors and crimes of all kinds, less in the masses of the nation than in the dregs of the foreign tribe in general, which is formed next to the real people by the force of circumstances and habits accumulated for centuries. Almost always, for such a nation, the punishments must be measured against the nature of this bastardized race, which is the source of crimes, and the regeneration of which can barely be glimpsed, after many years of the wisest government. The peasant is an evil, cunning, ferocious beast, half-civilized; he has neither heart nor integrity, nor honor; he lets himself be led to ferocity, were it not that the other two states crushed him mercilessly and reduced him to not being able to commit the crime he would want to commit. “Go, and do your penance”: this is the moment where Foucault would turn from an archeological method, which had been inadequate to explain the generalization of the prison-form, to the genealogical method. For Foucault, the prison-form could not be derived from an archaeological examination of the penal theories of the great reformers of the eighteenth century. It traced instead to the moralized notion of penitence. It is precisely this marriage of political economy and a genealogy of morals that might help us to visualize our current political condition. The Illusion of Free Markets may not have paid sufficient attention to this dimension, namely to the moralization that is necessary for so many of us to swallow neoliberal penality. But it is certainly present. The traces of a moral struggle, of a battle, of what Foucault described in The Punitive Society as a civil war, the idea of the criminal as social enemy, these are all over the texts, from the eighteenth to the twentieth centuries. The natural and fundamental laws of societies . . . imprint themselves on men’s hearts, they are the light that illuminates and masters their conscience: this light can only be weakened or obscured by their disordered passions [leurs passions déréglées]. The principle object of positive laws is this very disorderliness [dérèglement], to which they oppose a severe punishment to those perverse men [une sanction redoubtable aux hommes pervers]. For, on the whole, what is it that is truly necessary for the prosperity of a nation? To cultivate the land as successfully as possible and to keep society safe from thieves and evil people [des voleurs et des méchans]. The first part is governed by self-interest, the second is entrusted to the civil government. Quesnay’s writing is truffled with demoralization of the “perverse men” who are “out of order” and need to be punished. Dupont de Neumours as well would moralize his discourse. In response to a discussion in Beccaria’s little tract from 1764, On Crimes and Punishments, advocating severe penalties, including the galleys, for smuggling, Du Pont would viscerally write about the moral righteousness of private property. To Du Pont, the real criminals are not those who smuggle contraband, but those who regulate commerce: “If there is, then, a true offense that deserves prison and penal servitude, it’s not that of the smugglers, but that of the Regulators who have proposed and still propose, who have compelled and still compel the adoption of royal edicts that hamper trade, of fiscal inquisitions, and of monopolistic threats to the natural rights of citizens, to their property, to their civil liberty, deterring useful work, and as fearsome for public as for private wealth.” The notion of the “real” criminal, of the “real enemy of society”—this moralization of crime infuses Dupont’s response to Beccaria. For the past five years we have been deluged by Government programs for the unemployed, programs for the cities, programs for the poor, and we have reaped from these programs an ugly harvest of frustrations, violence and failure across the land. And now our opponents will be offering more of the same—more billions for Government jobs, Government housing, Government welfare. I say it’s time to quit pouring billions of dollars into programs that have failed in the United States of America. These are some of the moralizations that make us tolerate the paradoxes of neoliberal penality and blind us to the reality and devastating consequences of mass incarcaretion today. We’re always used to talking about the “stupidity” of the bourgeoisie. I wonder if the theme of bourgeois stupidity is not a theme for [artists, for intellectuals, for philosophers]: those who think that merchants are dim-witted, that financiers are obtuse, that those in power are simply blind. Sheltered by these caricatures, in fact the bourgeoisie is remarkable in intelligence. The lucidity and intelligence this class, which has captured and retained power under the conditions that we know, produces many effects of stupidity and blindness, but where? – if not exactly among intellectuals. We might be able to define intellectuals as those upon whom the intelligence of the bourgeoisie produces an effect of blindness and stupidity. One gets a sense of this when one rereads Dilulio or Banfield, or when one goes all the way back to Quesnay and Dupont. Our understanding of the political economy of punishment today must be twined to a genealogy of morals: it is the only way to understand how the new political economies of mass incarceration become normalized. How, in effect, the intolerable becomes tolerable. For any war in the history of any country Power is the first and foremost element which causes it.